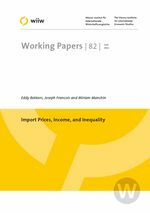 We compare three theoretical explanations for the positive empirical relationship between importer income per capita and traded goods prices. A first explanation is that consumers with higher incomes demand higher quality goods with higher prices. A second explanation is that wealthier people exhibit an increased willingness to pay for necessary goods as more goods enter the consumption set in a hierarchic demand system, and can thus be charged higher markups. A third explanation is that consumers with higher incomes are more finicky regarding their preferred variety in an ideal variety framework and can thus be charged higher markups. We discriminate between these three theories by focusing on the effect of income inequality on trade prices. Based on a large dataset with bilateral HS6 level data on 1260 final goods categories from more than 100 countries between 2000 and 2004, we find a highly significant negative effect of income inequality on unit values. This contradicts both the demand for quality and finickyness theories, while providing support for the increased willingness to pay theory linked to hierarchic demand. These findings on income inequality do not falsify the quality expansion model and the ideal variety model per se. However, the results do argue for place of importance of hierarchic demand.